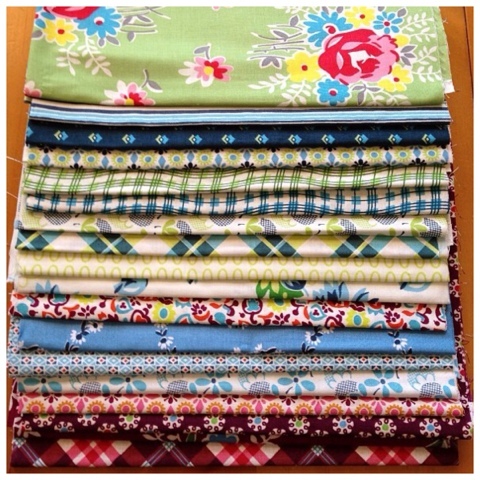 Sunny in CAL: Sew Mama Sew - Giveaway Day AGAIN! It's that time again. Sew Mama Sew Giveaway Day! If you are new to my blog - Welcome! I'm so thrilled to have you! I love paying it forward to all of you wonderful peeps. I'm so glad to be in a position to participate again. 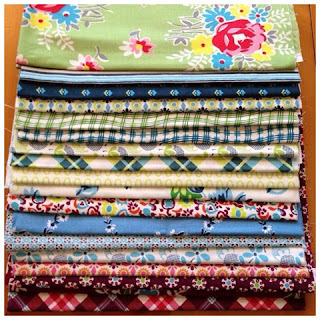 I'm giving away a Fat Eighth set of Sugar Creek by DS Quilts. I haven't made a quilt yet, but hopefully I will this year. I believe this line was sold at Joann's but is discontinued and no longer in print. 1. Leave a comment.... totally non related to sewing but... What are you doing this summer? That's it! Easy Peasy! This is giveaway is open to international peeps too! No way I'd ever forget you guys! This giveaway closes Friday, May 10th. Winner will be announced Saturday, May 11th. Good Luck! I'm also going to give away another Fat Eighth set on Instagram because that's how I roll! If you're not on Instagram, you need to be. You are definitely missing out on lots of fun! I'm sunnyincal on Instagram and in order to win, you need to be a follower. I will be taking a trip this summer. Not sure where, but we always do. I'll also be doing lots of sewing and finishing up tons on projects. PPS. Why yes, my little blog DID get a lovely makeover! We'll be busy...hopefully going to Myrtle beach. Thanks! Following your blog now. Thanks. This summer I've got two fabulous weekends planned to meet up with my bee mates, and I cant wait! I will just be enjoying visiting my grandchildren and quilting with friends. I don't really have any plans yet. Thanks for the chance to win. Sewing and gardening, sowing and sewing.... I grow veg in the garden and I have a WiP list as long as forever so I may inside-outside all summer! Yay I am already a follower - great giveaway WOW! I am going to the FQ retreat in London after going on a Baltic Cruise this summer. Thanks for a chance to win. I said tell me what you're doing. Not make me insanely jealous! :) you are going to have soooo much fun. Please post lots of photos!!! Great giveaway. I actually have no idea what I'm doing this summer but I'm sure there will be at least one visit to the inlaws. I am looking forward to having all of our family together this summer and spending 5days at a house on the Washington coast. There will be 29 of us. This summer I'll be doing all kinds of fun things with my son: factory tours, hiking in parks, mini golf, swimming, reading, going to movies...fun times! I'm following your blog with the feeddler app. I hope to go to the beach a lot. Thanks! I hope to do some camping! Thanks for the great giveaway! This summer I am going to my fist ever sewing retreat and I can't wait! Thank you for the giveaway opportunity! Just hanging out with my two young kids at home mostly. We may venture to the beach (several hours away) if we get brave enough. We're going to visit family for the boy's birthday on the 4th of July! This Sumer we're taking a small camping trip and then getting my oldest ready for Kindergarden! The awesome thing about all these giveaways is the new bloggers and instagrammers I'm discovering! Just started following. What I will be doing this summer. Kind of a downer, my mom will be undergoing treatment for breast cancer and staying with me a lot as her doctor is in town with me and she lives 2 1/2 hours away. Hopefully my twins will give her a lot of laughs on her road to being cancer free. I will be working. I have already had my vacation this year. What a pretty stack! I love the plaid at the bottom. I've never seen it before. I'll be spending my summer at the pool with my girls...every day! I follow in reader but I suppose it time I find something new! Visiting family out of state is always first on my summer list! No serious plans for the summer...except maybe a lot of hanging out at the beach. It would be a crime not to when it's only a block from my house. I get to relax at the beach! Hopefully, I'll be busy getting a tan while chasing after my little ones at the splash pad or pool. Going to the FQ Retreat. And working. I'm hoping to land a job this week and be working over the summer. Thanks! I am going to spend some time camping and hopefully go to Utah. This summer I will be celebrating my birthday and wedding anniversary! We just bought a house in February so we'll be doing LOTS of house projects this summer. Thanks for hosting! Thanks for such an amazing giveaway! This summer I will take my young son back to the UK to spend some time with my mum (we live abroad) and perhaps a week away in the sun? I'm going to hurry up all my yardwork so I can sit out in the sun and embroider to my hearts content! spending lots of time by the pool with the kiddos this summer! Just started following on Instagram! I'm going to get TAN! This is the first time in many years I've lived somewhere where we have a yard. So, yes much of this tanning will take place while mowing or doing other yard work, but hey that's multitasking! I also have a long list of sewing projects to work on during rainy days. I'm going to England for 3 weeks in July. I'll be a group leader of a group of 25 teenager... Scaring! We're off to Legoland and Arizona this summer with the girls. What a fantastic prize package! Thanks for sharing!! making a baby quilt for my very best friends first little one! Hopefully me and the hubs will be starting a family! We're moving to another state this summer so I'm sure I'll be unpacking for a while! I am going to Florida for a friend's wedding! This summer I want to go to the beach like everyday and get TAN! I am watching my little grandson for six weeks (yay!) and waiting for my new granddaughter to be born in August. hopefully going to the beach. Not to brag, but I'm going to PARIS! Moving to a new home this summer. No big plans for the summer. I'd really just enjoy spending more time with my hubby. We don't have anything big planned, just some small trips to see family and such. This summer I am taking classes for my grad program...but I hope to have some time for sewing & camping. thanks for the giveaway! Cruisin' and relaxing. Always sewin' It is my life. I love what I do!!! gpoing to italy and southern france! I live in the tropics, so it's summer all year round, but in July - your summer we will be spending two weeks in the sun in Cairns, Australia and visiting the Great Barrier Reef. No big plans this summer- just started a new job so not a lot of time off. Hopefully a few long weekends with friends though. This summer I am NOT moving or planning a wedding. Yea! More beach time is the goal. I am getting divorced, selling my house and buying a new home for my son, my dogs, my studio, and me. I am creating a new and happy life for all of us. I follow (just started) via feedly. Helping my daughter fill out college applications. :) Thanks for the chance to win. Hanging out with my "men!!" thanks for the chance! and I'll be enjoying as much of the sunshine as possible this summer! What delightful fabric! I'm going to spend as much time as I can playing outside with my 3 year old granddaughter. I don't have any summer plans, I suppose I will be working...but maybe I can get a long weekend to go visit the Nana in Florida. I don't yet have any particular plans for the summer but I'd love to travel someplace wonderful for a week. Thanks for participating in the giveaway. The fabrics are lovely. This summer I'll continue to recover from some health issues, which makes sitting in the sewing room okay to do, guilt-free, instead of housework! I am hoping to get some landscaping done in our yard. Since I have never done anything like that-it should prove interesting! LOL I would also LOVE to be planning out a quilt using those fabulous fabrics!!! I was just getting back into quilting and totally missed this collection! Thanks for the chance to win some of it. We are moving at the end of summer (back to Fort Hood, TX)so we plan on making a couple of trips to soak in our 2 year stay in SC. I cannot wait to explore Charleston some more and check out a new plantation. We haven't been to Mrytle Beach yet but we need to check it out. Savannah, GA is one of my favorite places! So much history, amazing food, and it's just beautiful. Great thing about this area is that each of these places is less then 3 hours from us. Also visiting the strawberry farm a couple more times. We don't have those in Texas. lol Thanks for the great giveaway! New follower with Bloglovin' but I've been following you on IG! I am visiting family in West Virginia, quilting, helping granny with yard work + other chores and volunteering. We're just about to head into winter here! I'll be doing lots of quilting and snuggling! It's funny to think of what I will be doing this summer - as we are just heading into winter over here in Australia. I plan to try and do more sewing and knitting during this time until it will be warm enough again to spend days outside and at the beach with the family. This summer I'm going to spend time tending my garden and going camping with my family. I will spending a lot of time in my garden and going to Florida one week. Have a good summer. Hopefully I can get some quality sewing time. Otherwise I have my twin nephwes' 1st birthday to look forward to. We're trying to figure out what we're doing this summer right now. Whatever it is it will be a staycation kind of thing. Staying put but family and friends will visit throughout the summer! I want to work on a birthday quilt for my sister. I'm due to have a baby tomorrow! So this summer's going to be completely baby focused! Thanks for the opportunity. I'll be busy studying for exams, so there won't be much sewing time for me. Wonderful giveaway! I love DS anything! This summer will be our 25th wedding anniversary. I'm going to be working on Denyse's Proverbial Quilt as a gift for my husband. I've got a long road ahead of me! We will probably spend some vacation time in Massachusetts this summer. I hope to return to Boston for another visit :-) Thanks for the chance to win - love Denyse Schmidt!! I am a long-term follower - love your blog!! We aren't doing a lot, but we will be taking a few weekend trips in-state! Thanks for the giveaway! Oooohhhh, wonderful giveaway!!!!! I'm not doing any travelling this summer but will be busy at home looking after my 4 girls and mother. I plan on hand sewing lots of hexies during soccer games throughout the summer! Thanks so much for your awesome giveaway! I already follow your blog via email subscription! I have no plans for the summer; we will probably stay home and go to the beach some days. Thanks for the chance! I have plans to go to the cricket as much as possible. This summer I will be teaching my little boy how to swim! Pools, here we come! I would love to see that bundle in person, thank you for the chance to win. This summer I am going to London for the Fat Quarterly Retreat and then going to the coast to chill and relax, at least I hope so. And now I follow your blog, I meant to do that much sooner. This summer we are doing an epic Disney and southern states trip, rounded out with a new baby in July! Hopefully doing lots of sewing but going away in June too with a group of friends. Well, it's coming into winter here which means lots of knitting time, I'm planning several pairs of socks and some mittens too. I'm glad Autumn weather has finally arrived here, we had a late hot summer. Thanks for the giveaway, love the fabric! Going to the beach for a week (and trying not to get burned!). Heading to Colorado for a family wedding! We are building a house so hopefully by spring I'll be making it a home. We live on a lake and I've become obsessed with SUP (Stand Up Paddleboarding). I try and do a lap around the lake each morning as long as it isn't too windy! Gorgeous fabrics! I live in Ireland and this summer I'm hoping to do some exploring. I've lived here for 11 years and there are still so many places I haven't visited, and it's such a small country! Hopefully we'll be taking lots of trips in our motor home this summer to the mountains just west of us! I followed your blog! It's about time, I've enjoyed following you on Instagram. I'm finding lots of my Instagram friends blogs thru this giveaway :). Oh, and I LOVE the fabric you are giving away...love, love, love. No big summer plans - drinking lemonade, reading and sewing. Thanks for the giveaway! I'll be juggling summer school and swim lessons for my 5-year old and trying to entertain my 7 month old. Fun times! Thanks for the giveaway. I be staying at home this summer. My husband mows yards for a living, so in the summer we stay put. I'll spend my time sewing. we usually vacation in the fall so this summer all we will be doing is trying to stay cool! I have a new job, so no vacation for me this summer. I will be staying home being grateful and quilting!! This is going to be my first relaxing summer in over three years! I can't wait! I am going to try to sit back, do some sewing, enjoy my kids, read some books and take it easy. We go so hard the rest of the year. Thanks for the chance to win! I will spend some time in the mountains in a wonderful place. I am following now through GfC. I follow your blog via GFC and BlogLovin; thanks for the chance! I will be relaxing in the mountains. Because that's where I live! Yeah, I know. I am so LUCKY! I'll be doing some decluttering in our home. Later in the summer we will see our daughter and granddaughter who live 800 miles from us. Thanks for the giveaway. I love DS fabrics. I am spending my summer running my kiddo to activities and I'm hoping to reorganize and finish a room in our basement. Going to Sunny San Diego in June! I'm spending lots of time outside! This Summer I'll be moving to our new home, I'm really longing for it! We'll be finishing the cabin we just bought. My grand daughter is coming for the summer for her first time without mom and dad! our baby boy is due in July and our little girl just turned 1 so we will be busy with the kiddos this summer. going to the beach with my goddaughter! I'm going to be spending my time at our cottage enjoying the warm weather (finally!). Thanks for the chance! I follow your blog! Thanks for the chance. Also moving closer to my grandchildren. So boo to moving, but yaay to more grandkid time. Thanks for the giveaway chance!